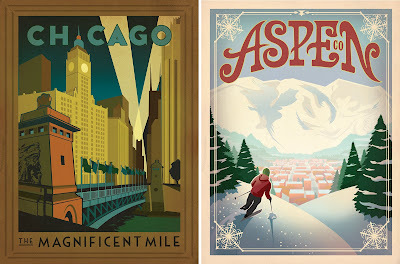 ADG set out to celebrate the history and charm of America’s favorite destinations in a series of classic travel posters after Creative Director Joel Anderson got fed up with the cheesy, low-quality postcards & prints available in the gift shops of his favorite places. 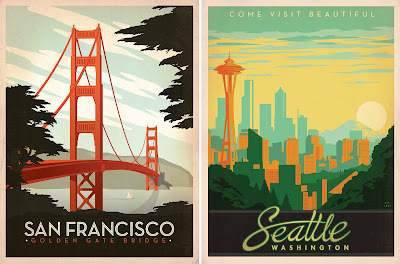 So he began directing a little symphony of artists who interned at his firm, guiding them in the creation of new imagery in the style of the Golden Age of Poster Art. 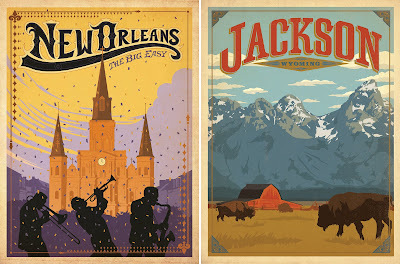 The new “vintage travel” designs are sold as limited edition prints at www.ArtAndSoulOfamerica.com and licensed to stationery and gift companies for the production of not-cheesy keepsake items and memorabilia. Special thanks to interns Julian Baker & Andy Gregg.